Although MS Outlook is the most widely used application for email and information management, many users complain about issues and error messages they encounter. 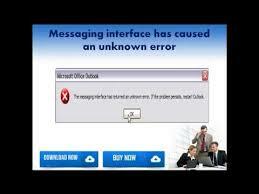 In this post, we discuss a common error that reads ‘Messaging interface has caused an unknown error’. We provide you with some potential solutions to resolve the error. This error can occur in a variety of situations. For instance, it can occur when you are trying to open email messages or you try to compose/reply to an email. It is also seen when exporting a PST file. So, this error is not specific to a certain situation. Encountering such error messages in Outlook can pose problems and requires immediate resolution. So, let’s look at solutions to resolve the error. Compatibility mode is useful to run Outlook on an older operating system, but this may cause certain conflicts. Disable compatibility mode and check if helps fix the issue. To do this, you will need to locate the Outlook.exe file. Once you find the Outlook.exe file, right click on it and choose Properties and click on the Compatibility tab. Now check if the error persists. If it does, proceed to the next step. The error can arise if Outlook is working with a PST file that is over-sized. There is a certain size limit for PST files and if the limit exceeds, Outlook may become unstable or produce errors. Compact the PST file by following the steps below and check if it helps resolve the issue. If compacting PST file does not resolve the issue, there may be other reasons for the error. A possibility is that the PST file is corrupt. And this may happen due to multiple reasons such as the improper closing of Outlook while PST file is being accessed or due to third-party tools that interfere with PST files. Repairing the PST file can help resolve the error in most cases. There is a built-in tool called Scanpst for this purpose. The location of Scanpst is different for all Outlook versions. Begin by searching for Scanpst.exe in the Search bar. Once the tool is located, double-click on it to run the application. Then you will need to identify the location of PST file. Click on File > Account Settings > Account Settings. Click Data files tab, identify the PST file and note down the location. Then click on Browse to select the PST file to repair. The tool scans your file to check for errors and a scanning report is displayed. If any errors are found, click Start to begin the repair process. The repair time depends on the level of corruption and file size. Once the repair process is complete, you will get a success message. If not, repeat the process until the errors are fixed. If it completes successfully, your PST file will be repaired. However, Scanpst may not repair all kinds of errors. Professional PST repair tools are your best option. Remo Repair Outlook (PST) repair tool is a top choice. It is designed to repair corruption in PST files and recover deleted emails, and other Outlook attributes like contacts, calendars, notes, tasks, RSS Feeds, Settings, etc. The software can also be used to recover deleted emails in Outlook.